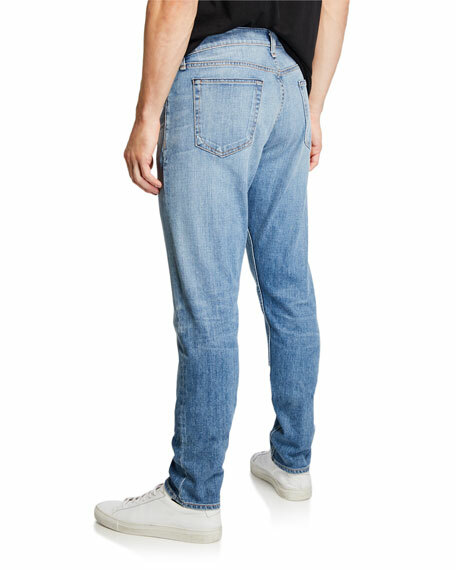 Rag & Bone Standard Issue Fit 1 jeans in 11.5-ounce Japanese stretch denim. Approx. measurements: 9.3" rise; 33" inseam; 12" leg opening. Regular fit through hip and thigh. Balmain jeans in gray-wash distressed denim. Five-pocket style; zip pocket front detail. Logo patch at back waist. Slim fit through skinny leg. Button/zip fly; belt loops. Organic cotton/spandex. Made in Italy. 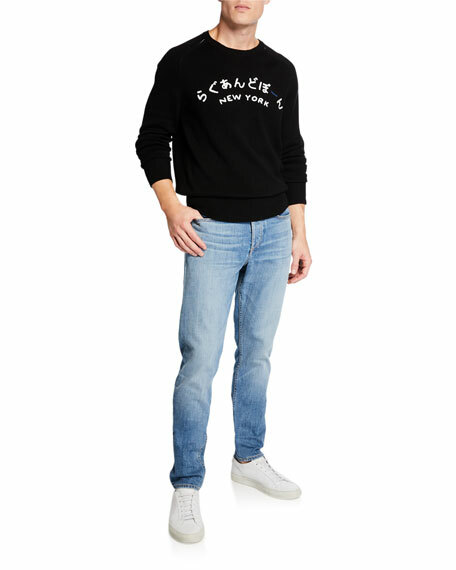 Model's measurements: Height 6'1"/185cm, waist 32"/81cm, typically wears size M.
FRAME "L'Homme" jeans in faded stretch-denim with whiskering. Regular rise; belt loops. Button/zip fly. Five-pocket style. Slim fit; straight legs. 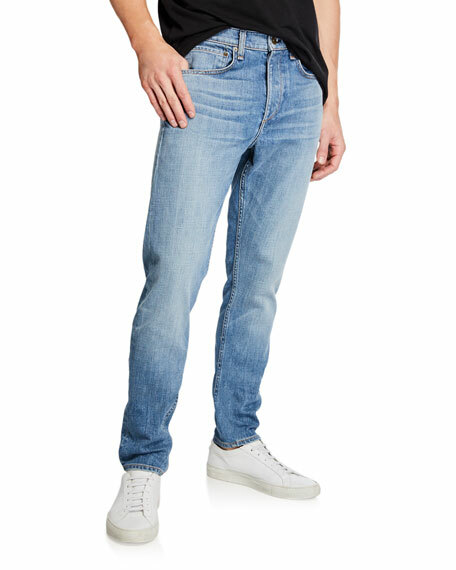 FRAME "L'Homme" jeans in faded stretch-denim with whiskering. Regular rise; belt loops. Button/zip fly. Five-pocket style. Slim fit; straight legs. Cotton/polyester/spandex. Made in USA. Model's measurements: Height, 6'1"/185cm, waist 31"/79cm, suit 40, shirt 15.5x35, inseam 32"/81cm. G-Star "3301" jeans in dark-wash denim with 3D whiskering and fading. Five-pocket style; tonal arc stitching on back. Seam and panel detailing at thighs and knees. Button/zip fly; belt loops. Cotton/lyocell/polyester/spandex. Imported.